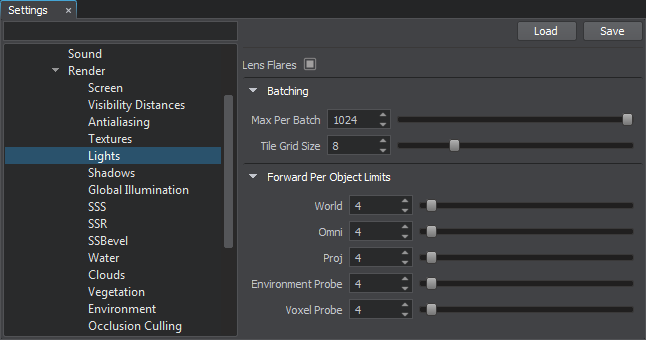 This section contains lights-related settings, such as lens flares effect, batching parameters as well as per-object limits for forward rendering pass. Toggles the Lens Flares effect on and off. Maximum number of lights rendered by a tile per batch call. With lights batching optimization, omni lights divided into tiles are rendered in batches: each tile renders the specified number of lights per batch. It makes it possible to decrease the number of DIP calls and gain performance. The optimization works only for omni lights with point shape and without shadows. Number of grid tiles per axis for tiled rendering optimization. During this optimization, the screen space is divided into tiles, that render lights in batches. Maximum number of world light sources per object (for materials rendered in the forward rendering pass). Maximum number of omni light sources per object (for materials rendered in the forward rendering pass). Maximum number of projected light sources per object (for materials rendered in the forward rendering pass). Maximum number of environment probe light sources per object (for materials rendered in the forward rendering pass). Maximum number of voxel probe light sources per object (for materials rendered in the forward rendering pass).